Raize MP4 Converter is a professional mp4 converter to convert popular video formats to MP4 (MPEG4). It can convert DivX, XviD, MPEG, MOV, MPG, MOD, QuickTime, RM, rmvb, 3GP, 3G2, SWF, GIF, DV, MJPEG, VOB, WMV, ASF, AVI to MP4, such as AVI to MP4, MPEG to MP4. Raize MP4 Converter supports H.264 codec, and allows you to play the converted MP4 video on your portable media player (MP4 player), such as Archos, iRiver, Creative Zen Vision. You can also convert MP4 or other popular video formats to DivX, XviD, or MPEG format with Raize MP4 Converter. Many settings are adjustable, such as video size, bit rate, frame rate. So that the output MP4 video will match most portable media player, such as Archos, iRiver, Creative Zen Vision, and Sandisk Sansa. High converting speed, wonderful output quality of MP4 video. It is very simple and easy to use. Just right click on add button to add a video files and convert them using your predefined settings. Raize MP4 Converter allows you to convert AVI to MP4, MPEG to MP4. It supports DivX, XviD, MOV, QT, 3GP, RM, WMV, VOB to MP4 format as well. You can also convert MP4 or other popular videos to DivX, XviD format, such as MPEG to DivX, XviD, MP4 to DivX, XviD, WMV to DivX, XviD and so on. 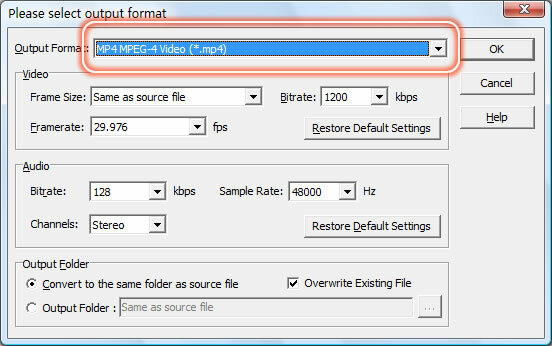 If you want to convert your video to MPEG format, Raize MP4 Converter can help you. It supports both MPEG-1/VCD, MPEG-2/DVD/SVCD formats. It allows you to convert your faverite video to format for playing on Creative ZEN Vision W, Creative ZEN Vision M and Creative ZEN V Plus player. Convert video for your portable video player including Archos 404, 504, 604, AV 500, AV 700, Gmini 402, Gmini 500. Using Raize MP4 Converter, you can convert just about any kind of video file (AVI, DivX, MPEG, WMV, and so on) for viewing on your Sandisk Sansa e200 Series MP3 Players, including SanDisk Sansa e250, e260, e270, e280.